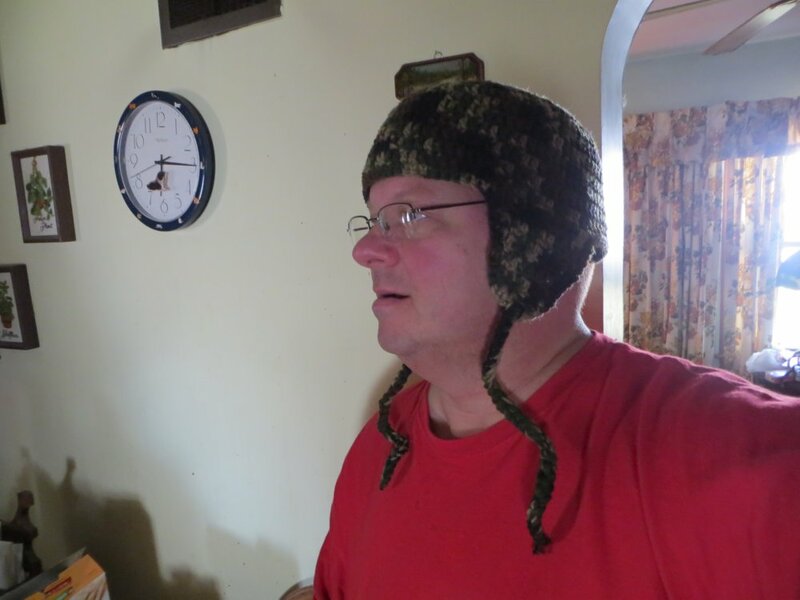 Camo… a “stealthy hat” ? Winter is coming – fast! This weekend I will be outside quite a bit and some of the time the weather will be in the 30s and eventually the 20s by Monday. One of the first things to get cold is the tips of the ears. Unfortunately, I couldn’t find a hat that I really liked – let alone wanted to spend money on one – so I made a couple of hats! I learned to crochet in approximately 1977 after breaking my collarbone. Grandma Harris was an avid knitter and crocheter and while I was laid up that summer, she taught me to make projects featured in the little magazine called “Workbasket”. I’ve been practicing the craft for about 35 years and, though not an expert, would consider the skill set “advanced”. A few years ago the relatives begged me not to make any more afghans for Christmas presents. We had too many already! Off and on over the years I’ve put the crochet hooks away. For a time I felt it was a sissy, girlie kind of hobby. A man, crocheting? To do something like this must be wrong. I gave up crocheting for a while. Then, in my thirties, it dawned on me that you have to live your life no matter what others think. Are we here to make them happy at our own expense? Hopefully not! Now that I am actively crocheting again, it appears that this is a handy skill for a vandweller to have. There have been other irons in the fire recently. For the last couple of months, I’ve been working on a scarf for my sister as time allowed. Her garment was much more detailed and used a diamond shaped crochet pattern. It was not difficult by any stretch but needed careful attention. This scarf was a project worked on while watching all the presidential election debates. Like the election itself, I’m glad the scarf endeavor is over, too! I was getting sick of both! 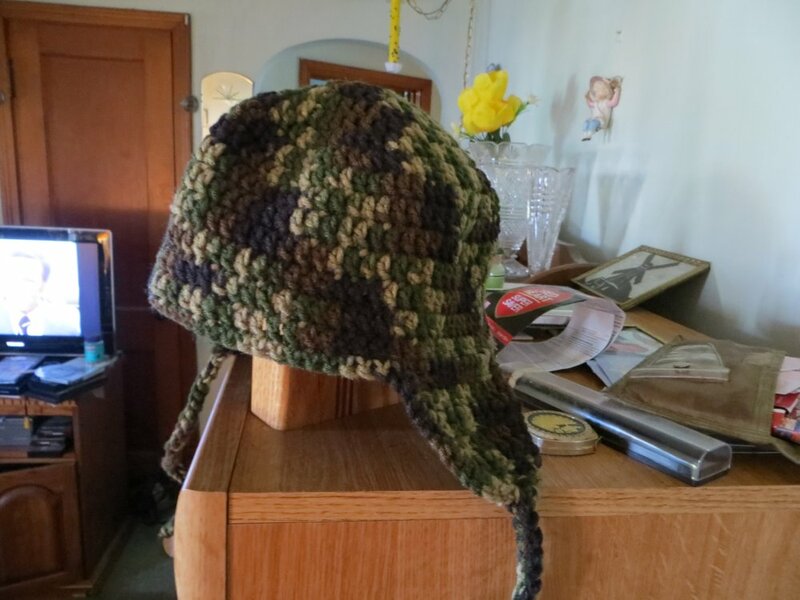 So, with Sis’ scarf completed, it was time to turn to my own need – a hat to protect the ears while camping… I fished in the Google search engine pond and had good luck. There is a cool pattern on the Internet which I slightly modified. The first hat (shown above)took 3 hours and then a second hat was made in 1.5 hours. The first was a traditional camouflage color. 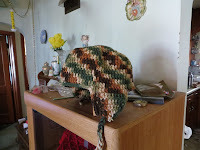 The second hat (show on the left) was made from a variegated yarn called “Woodsy” (Red Heart Wintuk brand). 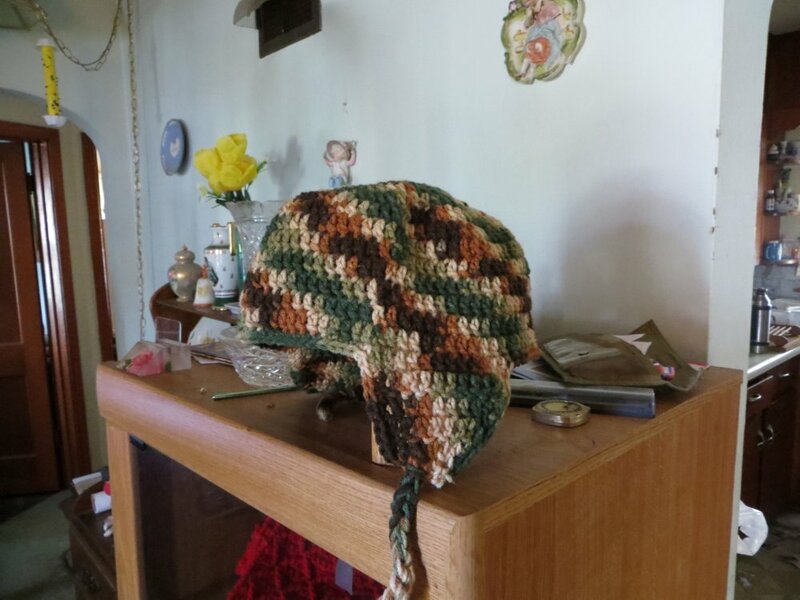 For those who crochet, just do a search on crocheted flap hat. Sadly, the site where I found the pattern has since been taken down. Still, there are hundreds of cool patterns to be found for free. Time is slipping by quickly. I have to go to work but wanted to share this idea about the hat. Crocheting is a valuable skill for anyone but particularly for those of us who wish to be more self sufficient and do so with our own labor. Besides, it’s therapeutic as well as a good excuse to pop in a favorite movie… We can call that “multi-tasking”. I guess I forgot to mention the cost… Each hat takes about 4 ounces of yarn – around $3.00. If you are at a thrift store, maybe a buck? Let’s see Walmart beat that deal. Have a fun rest of your Thursday… Take care! 3 Responses to Need a Hat for the Winter? Make one! Very nice. You should make a couple of them and see if you can sell them to other van dwellers. Do a search on Youtube for Slab City, CA. It’s quite an interesting place. Like the hat! It would be great for plowing snow this winter, coupled with a scarf like yours I would definitely stay warm and toasty, Just heard on the local news, this winter’s snow fall should be close to normal but the temps are to be colder than normal here in PA. BURRR!!! very cool dude. i am a girl and i do all kinds of “manly stuff”. all my sisters do. let us be well rounded in all things! my mom taught us girls one year when we were kids how to do a one line string. we never got any further. i would really like to learn how to do both crochet and knit. 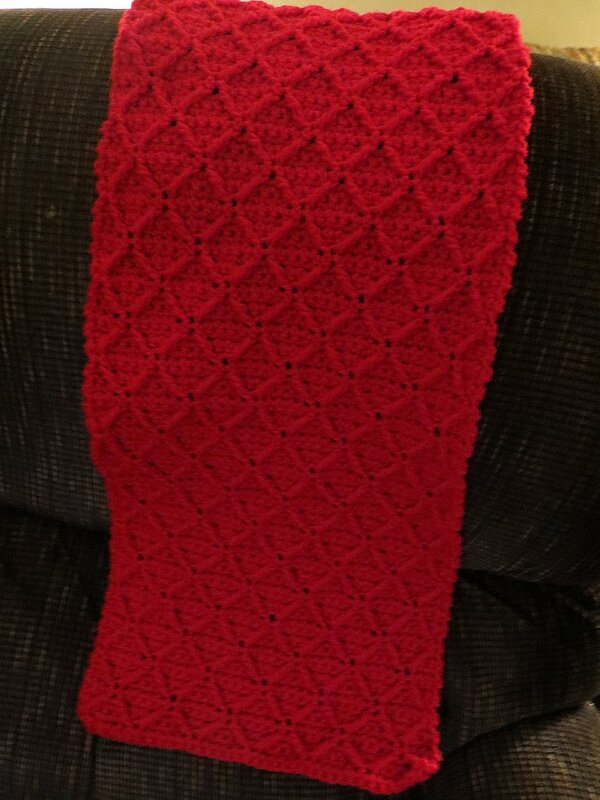 my daughter received a gorgeous large hand knitted baby blanket, it was exquisite. among all the other vast array of knowledge, this is another very good tool for the belt.